How Does Your Pen Write? Recently I picked up a new pen. The pen was labeled ” MaxGlide stick” by Hub. 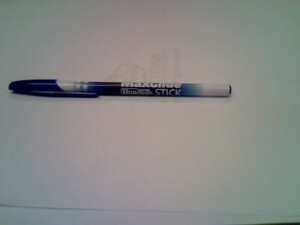 It is a simple cap off plastic pen with blue ink. The new buzz word for an easy writing ink pen is that it glides with no smudging or leakage. Who wants ink on their fingers? Writing should be an easy task, so we invent pens that make it easy for us. Especially if I needed to take notes quickly. I can see the purpose of this pen for others who answer several telephone calls per day and who take notes for several hours. The ink did glide smoothly. However, the pen was more interested in letting the ink out albeit was easy to write with the inexpensive glide pen. I much prefer the steadiness of a seasoned higher end ink pen that is weighted and made of metal verses plastic. A pen that makes me feel important and special. A nice pen is not used unless words to paper are important. The decision to select a pen worthy of writing is a decision to communicate with another. It causes the writer to slow down and pensively write with a more legible stroke. Which one of these styles of pens fits your lifestyle? I think its possible to have different pens for different applications, thus the result – writing instruments have once again raised to the top as a gift item and a promotional product. Some may say that a dog is man’s best friend. 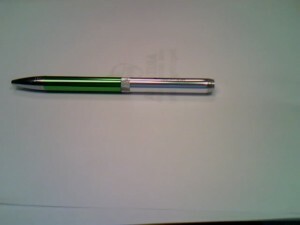 I say a great pen, a useful stylish pen is man’s best tool. Don’t they say the pen is mightier than the sword?